Most people served by public water systems are accustomed to turning on the tap and water flows out. Busy urban dwellers seldom ponder where their water is coming from, how it gets to their taps, or whether reservoir supplies are adequate. City planners generally rely on ‘paper water’ for new development, i.e., estimated projections of how much future water is expected to be available. New sewer regulations on the way…..The North Coast Regional Board is gearing up to develop new septic regulations to satisfy requirements of AB 885, a controversial regulation in the making for over ten years and finally approved a few years ago. 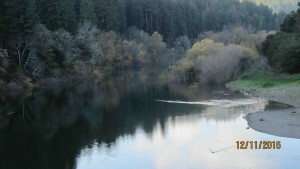 AB 885’s intent is to clean up waterways allegedly polluted by failing septics, and its implementation in our area relies on their assessment of bacterial problems in the lower Russian River, a process to be completed within two years. For California, the drought is worse than serious…..
“There’s a drought on, turn the water off!”. This phrase appears everywhere lately. While summer is here, abundant water is not, and living with severely reduced supplies may become the new normal for 2015. The U.S. Drought Monitor designates the whole of California to be severely dry now and there is dire need to stretch our limited supplies as far as we can. With the specter of global warming and unusual weather patterns, we now live in a new water reality that should persuade all citizens to regularly and stringently conserve water on a permanent basis. Sonoma County Gazette, May 2014: Is Voluntary Conservation Enough? Giving credit where it is due, because of Sonoma County Water Agency’s extensive year long media campaign calling for voluntary conservation, it’s hard to imagine that many water users in our County do not know we have been experiencing the worst drought of recorded history, even when substantial rain finally poured on our parched area in February and March. April is the month we celebrate the Earth, it’s bountiful resources, its diverse creatures and cultures and all its beauty. It is also the time when we need to consider the interrelationship of all life forms. Yet we tend to compartmentalize information and struggle to comprehend the vast web we all weave, seldom noting that every thing is connected to everything else, and every action reverberates through life’s web. Fresh, clean potable water is irreplaceable, yet instances of sullying limited water supplies with endocrine disrupting, cancer causing, birth defect resulting chemicals are growing day by day. Approximately 80,000 chemicals have been identified, including many pharmaceutical products, with at least 1000 labeled as endocrine disruptors. The array of sources for chemical entry into our water supply includes wastewater discharges, irrigation and storm water runoff, industrial spills, etc. Their mixtures blend into an undefined and inadequately regulated toxic soup.